An eyelid surgery, also called a blepharoplasty, improves the look of the upper and/or lower eyelids for a more rejuvenated appearance by removing excess skin and fat from the eyelids. Why do people choose an eyelid surgery? Some people experience excess fatty deposits that leave them with the appearance of puffy eyelids. Also, loose or sagging skin in the upper eyelids can create folds for an unnatural looking eyelid that can sometimes even impair vision. 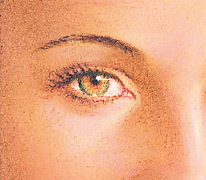 Others may experience excess skin and fine wrinkles below the lower eyelids. Either of these conditions can leave you looking older, tired and less alert. Eyelid surgery does not address crow’s feet or dark circles under your eyes or lift sagging eyebrows. Eyelid surgery can be performed alone or in conjunction with a facelift, brow lift or a laser/chemical peel to remove dark circles. How is an eyelid surgery performed? Drooping upper eyelids can be corrected through an incision within the natural crease of the upper eyelid allowing repositioning of fat deposits, tightening of muscles and tissue, and if necessary the removal of excess skin. The incision lines are designed for scars to be well concealed within the natural structures of the eyelid area and generally heal very well. 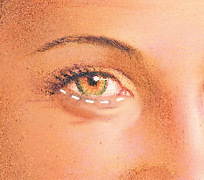 Conditions of the lower eyelid may be corrected with an incision just below the lower lash line. Through this incision, excess skin in the lower eyelids is removed in addition to removing excess fat deposits. A transconjunctival incision, one hidden inside the lower eyelid, is an alternate technique to correct lower eyelid conditions and redistribute or remove excess fat. What can I expect from an eyelid surgery? An eyelid surgery can offer you a smoother, better-defined eyelid and/or correct “bags” under the eyes for a more youthful, alert and rested appearance. Along with a new look, many patients will enjoy an improved self-image and increased self-confidence. How can I learn if an eyelid surgery is right for me? If you would like to make an appointment for a consultation to learn whether an eyelid surgery is right for you; contact Dr. Art Armenta’s office. Dr. Art Armenta is a Diplomat and is certified by the American Board of Plastic Surgery and is a member of the American Society of Plastic Surgeons.